Rosetta Stone® empowers millions of people around the world to change their lives through an interactive solution that provides the fastest, most effective way to learn a language. 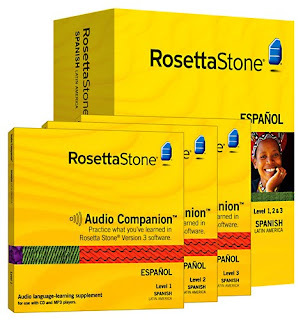 Rosetta Stone solutions teach communication skills the same way a person’s first language is learned as a child – connecting the language with its meaning, in real life scenarios. Rosetta can be used by anyone, at any age. There are three different levels (1 for beginners, 2 for intermediate, and 3 for advanced) for varying skill levels. ·Dynamic Immersion™ – helps the learner think in a new language from the very beginning, by bypassing translation and tedious grammar drills; language meaning is derived by connecting words and grammar with images. ·Contextual Formation™ – enables new language production from the first lesson by placing the learner in just the right context to intuitively know how to progress. ·Adaptive Recall™ – tracks progress and brings back material for review at just the right interval to reinforce learning. ·Advanced speech recognition technology – learners begin speaking from the start and the speech analysis tools help perfect pronunciation. ·Milestone feature – simulates real-life situations in which to practice the language. ·Audio Companion – allows users to practice what they’ve learned on the go. I took both Spanish and French in high school and I'm absolutely in love with the French language. So when I was contacted to do this review, I knew it could be an opportunity to brush up on my French language skills. After all, it has been over 15 years since I was studying it in school! Rosetta Stone is very easy to use and the speech recognition is a major plus. I've tried other language software before and it didn't recognize what you were saying, so I was never really sure if I was pronouncing things correctly. I'm glad that I was able to try this out and I hope that anyone else who has the desire to either learn a new language or brush up on past skills, would try out Rosetta Stone. That soft can be really useful for my sister to learn Latin.I'll strongly recommend it to her! I can tell you right now if I had the money to buy this, I would do so in a heartbeat! !